Truth be told, it was really a rib eye sliced like London Broil, but that really doesn’t matter. You see, the supermarket didn’t have flank stake, and even if it did, I didn’t really have enough time to marinate it tonight, so I went with rib eye instead. I also decided to try the balsamic vinegar and shallot sauce that Chef Jane taught us about in class. It came out great, even though the first reduction basically spattered all over the place when the vinegar hit the pan. I had a little bit of trouble timing everything out, as usual, but I was able to shut things down and turn them back on as the steak got close to finishing. Was it perfect? No. Was it acceptable? More than definitely. Was it good? It was delicious! As I was washing the dishes, I realized something…I cooked everything based on “doneness” rather than just on time. Even though the George Foreman people said to cook the steak six minutes, I poked it after six and “felt” that it needed a little more. When it felt right, I did cut it just to make sure, but I was pretty sure it was right. That’s a huge improvement for me. 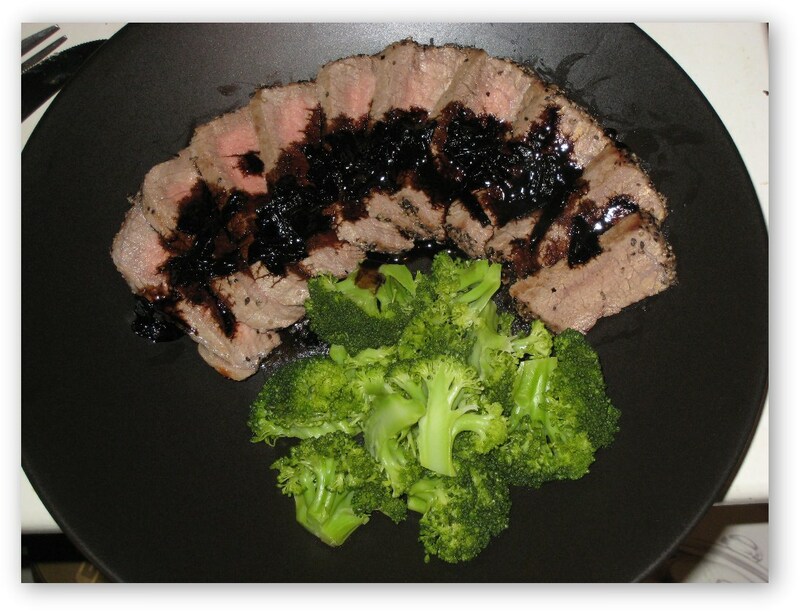 In addition, the sauce and the broccoli were done without measuring and timers, and just cooked based on visual and a taste test to make sure it was good.